LKBadgeView class draws text on round rect 'badge'. You should copy below files to your projects. 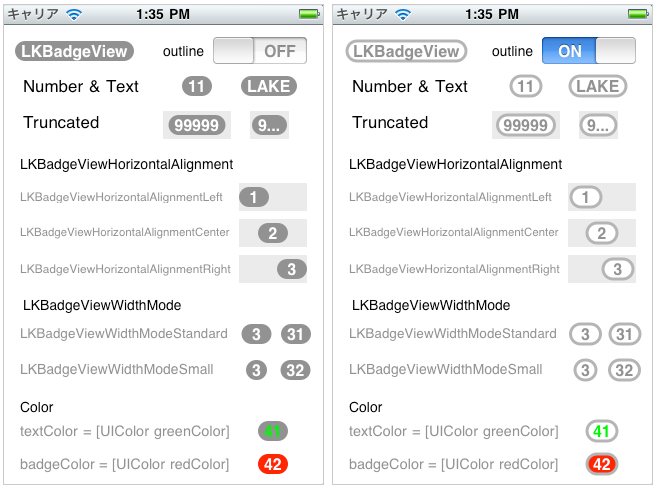 LKBadgeView is subclass of UIView. So you can add the instance to some view. You can use this class in XIB. The sample application use this way. The below properties can customize the view's behaivior. Minimum size has 2 way mode. LKBadgeViewWidthModeSmall: The badge shape becomes circle. LKBadgeViewWidthModeStandard: The width is certain fixed size in case of 1 char and 2 chars text. 3 chars and more. Text color and badge color are variable. (Default) textColor is white, badgeColor is gray. The outline property should be YES when you use outline. If the property is no, then the outline does not be drawn. Outline has color property and width property. (Default) outlineColor is gray, outlineWidth is 2.0. You can use outline with badgeColor. LKBadgeView can draw a shadow. If the shadow property is YES, then the shadow of the badge is drawn. 'shadowOfOutline' is for outline shadow. 'shadowOfText' is for text shadow. (Default) all shadow properties are NO. If text width is greater than LKBadgeView width, The text is truncated. The height of badge shape is fixed (20px). The value is avaliable as constant. Also class method +badgeHeight is avalible.